There is something special about homemade pickles.As I have shared before,we are not pickle fans.Yes,we do turn to our bottle of pickle when we have kanji or sometimes with dosa when there is no chutney or sometimes even idli.The bottom rack of my fridge is loaded with pickles,spoiling us for choices.So why did I make a fresh batch?? After a long time,I made some Lime sherbet.Every time I make it,I think of some ways to utilize the peels.I still have a dried Lime peel pickle made about 2 years back almost half a bottle full.So thought of doing a similar pickle like this and ended up with this delicious and tangy lime peel pickle.It has a very slight bitter aftertaste,probably because I used only the peels after squeezing out all the juice.You can try it like this or just quartered lime(without juicing). 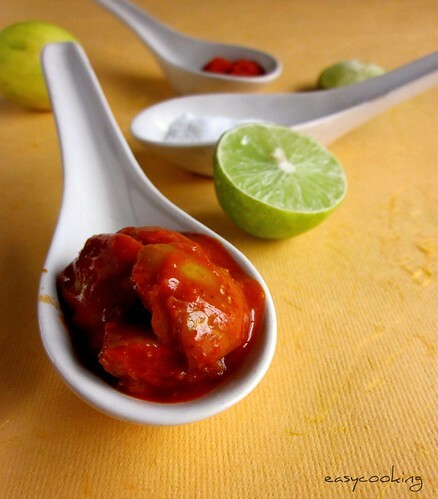 If you are using fresh lime for this pickle,quarter the limes and put in a big mixing bowl.Or else,after juicing the limes,follow the same procedure.Mix in the chopped ginger. 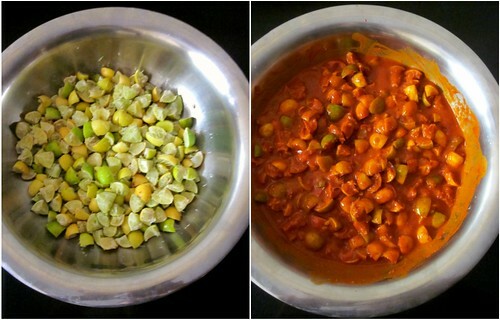 For making the masala-In a mixer,add the red chillies and pulse for a while till they become powdery. Add the mustard,salt and hing and add enough water to grind.Pulse till it becomes a smooth paste[it should not be grainy]. 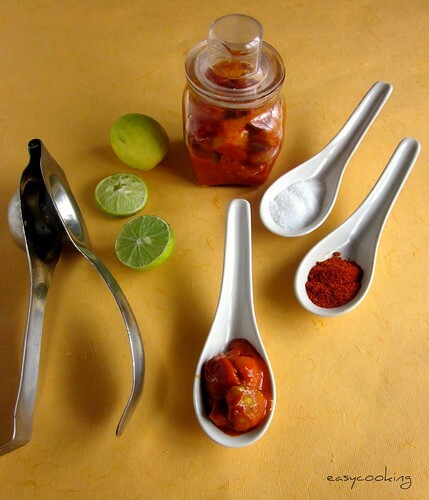 Mix this masala with the lime-ginger in the mixing bowl and give a good mix. Add in more water if the pickle is too dry.I usually add some water to the mixer and add it.But do not add much water as the lime will start oozing water as it sits. Do a taste test and check if it requires more salt or hing. Keep it covered overnight or at least for 5-6 hours for the flavors to seep in. 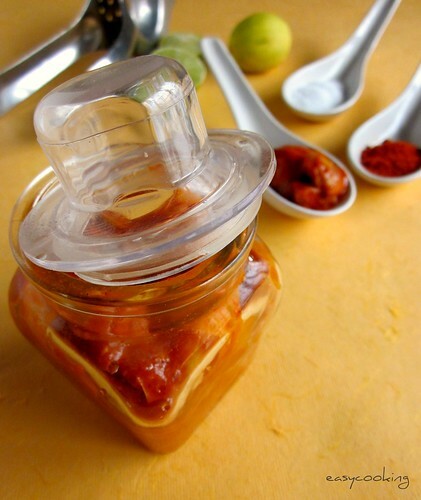 Pour into sterilized jars and keep refrigerated for longer shelf life. Now for the Giveaway winner.First of all,let me thank you for the overwhelming response.So many silent readers commented and said such nice things about the blog.Thank you,I am touched.I wish I could choose every one of you as winners! !But worry not,seeing the response,I am tempted to host more giveaways of such kind.All in good time. The winner is Anna(chosen through the random tool).Congrats Anna,the Pigeon Handi is all yours:).Please send me your complete address with phone number to divyakudua@gmail.com. Ooh mouthwatering pickle! Will try it some time soon.. I love lime pickles! And this one is absolutely tempting! would love to have some! Your pics are soooooo tempting !! a tongue tickler indeed. looks wonderful. Wow! Looks sooooo good!! Will be perfect with thayir saadham! Fingerlicking good pickle Divya and no oil makes it a keeper for me. Byadgi chillies? I don't think I've seen any here. Will regular dried ones do? Byadgi chillies are like Kashmiri chillies(the long dried ones)which are not so hot but provide a lovely red colour.If not reduce the amount of chillies and use the normal red ones.